"Tangy and soft, this sourdough bread is one of the most basic recipes you can make. This recipe makes one loaf, but feel free to multiply the ingredient ratios for a larger batch. You won't be disappointed!" Combine 2 cups flour, water, sourdough starter, butter, sugar, and salt in a bowl. Mix into a stiff batter. Beat for a few minutes using a wooden spoon or an electric mixer; the dough should be quite moist and sticky. Turn dough into an oiled bowl, flipping to coat all sides. Cover the bowl with a clean towel and leave at room temperature to ferment 8 hours to overnight. Turn dough onto a liberally floured surface. Knead for at least 10 minutes, adding an additional 1/2 cup flour or more as needed; the dough should be very smooth and elastic when done. Butter a loaf pan. 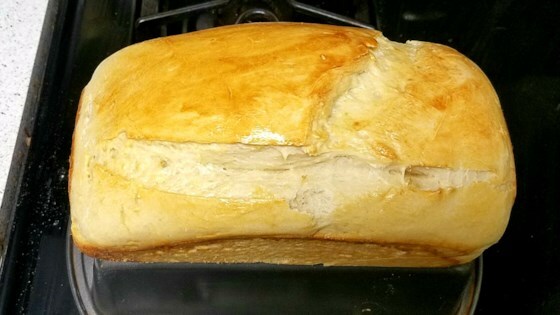 Shape dough into a loaf and place in the prepared pan. Cover with a clean towel and let rise in a warm place until doubled in bulk, 4 to 12 hours depending on temperature. Brush the top of the loaf with beaten egg. Cut a 1/4-inch slash down the center lengthwise using a sharp knife. Bake in the preheated oven until an internal temperature of at least 180 degrees F (82 degrees C) is reached, 25 to 30 minutes. Turn loaf out onto a rack and cool completely before slicing. I really enjoyed this bread! It was definitely worth the wait; I've. had my starter for a good while but most of the sourdough recipes I've tried just didn't do it for me.